At Wenex, our focus and passion has always been our cornerstone in designing and developing great web sites. Over the course of more than eighteen years, we have found that this can mean adopting new techniques, researching new technologies, and keeping abreast of new Internet trends. We bring the following to every client to ensure that they can thrive online. When putting together a web site, we not only pay close attention to a business client’s needs, but we try to anticipate that client’s future needs as well. A vital, lasting internet presence requires a great deal of flexibility and expandability, features we strive to build into all of our web sites. The means for achieving this goal lies in building web sites that employ a semantic code structure, separate content from presentation using CSS, and adhere to W3C standards and web accessibility guidelines. Our design techniques and philosophies reflect these practices. 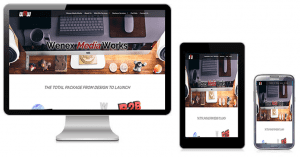 Responsive web design is a technique in web design aimed at creating sites that provide an optimal viewing and interaction experience on not only desktop monitors but mobile devices as well. The layout of a responsive web site adjusts to your device’s screen size and provides an optimal viewing experience, easy reading and navigation on mobile phones, tablets, laptops, and desktop monitors of any size. This means easy reading and navigation with a minimum of resizing, panning, and scrolling. When possible we incorporate responsive capable frameworks to develop our sites to provide the total viewing experience. Web sites need to be updated regularly since they are a means of communication for any size of business. People are using the Internet everywhere and at any time and regular web site maintenance is a must if the site is to be successful. Owning a web site or blog has it’s responsibilities; one can’t just upload it and forget it. Most importantly, search engines like Google and Bing favour web sites with the newest and most relevant content in their search results. Over time, if a site is not updated, it will will slowly fall down the rankings. The most exciting thing about the Internet as we see and use it today is the high level of versatility and interactivity that it possesses. Business owners can connect with potential and existing customers on a level that was previously unimaginable. Our goal is to bring that opportunity to our clients. Whether this means developing custom scripts using technologies such as PHP and AJAX, building on existing applications like JQuery or CakePHP, or interacting with services such as Facebook or LinkedIn, we can bring that excitement of today’s web applications to a client’s online project. For companies that have the opportunity or the need to perform large scale updates on a relatively frequent basis, we can integrate a Content Management System (CMS) into their web presence. We can cover every aspect of this special type of web project, including layout template creation, CMS application integration, and training on the administration and updating of the site. We feature the current popular applications such as WordPress, Joomla, or Drupal. Building a database into a web application can give it a significant boost in interactivity and functionality. We have a wealth of experience with integrating databases such as MySQL or MS SQL into web sites and building dynamic applications around them.